Arranged by season, these recipes re-create in edible form the natural treasures of Scandinavia. Delicate macarons are decorated like coltsfoot or blue anemone flowers, and the meringue peaks on a coffee ice cream cake resemble mountains. Hovland has an eye for tiny wonders as well as large ones: her almond cookies are shaped like siskin eggs, while the icing on hazelnut cookies depicts clouds drifting past a window. Each treat is a work of art, requiring craft skills like stenciling and sponge printing as well as baking prowess. The results are as pleasing to the eye as they are to the palate. Hovland’s chocolate rocks and seashells look so much like the real thing you’d hardly believe you can eat them. Just as convincing are her marzipan pears, naturally colored green with ground pistachios. In a few cases, the book incorporates actual edibles from nature, using real forget-me-nots or violets to top cakes. Most of the recipes rely on everyday ingredients; a few, like cardamom buns, may introduce North American readers to less familiar flavors. Where particular foodstuffs could be difficult to obtain, the author offers tips and alternatives: look for lingonberries at Ikea, or substitute cranberries. Certain treats can be made child-friendly by leaving out the rum or liqueur. The translation is never short of flawless, and quantities are helpfully given in both imperial and metric units. 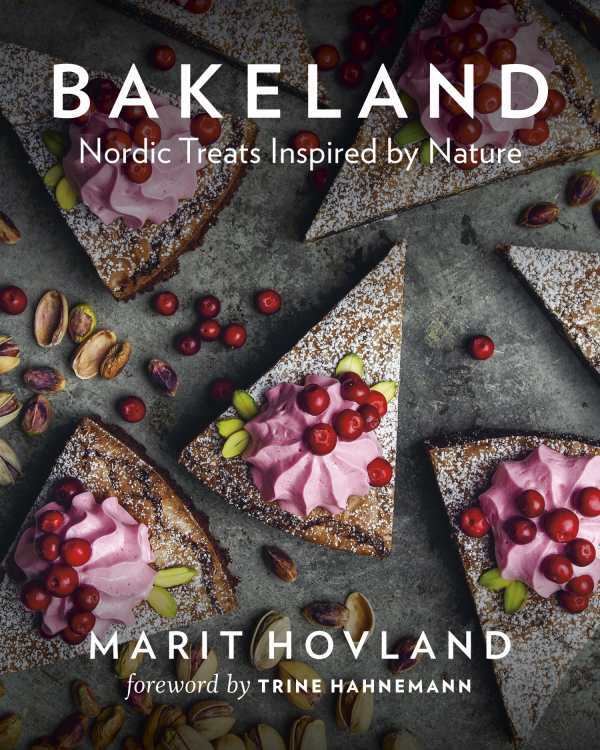 With its clear instructions, gorgeous photographs of Norwegian landscapes, and step-by-step illustrations of the more intricate procedures, this is an outstanding cookbook for the ambitious home baker.